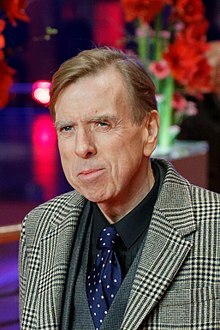 Timothy Leonard Spall OBE (born 27 February 1957) is a British character actor and occasional presenter. He became a household name in the UK after appearing as Barry Spencer Taylor in the 1983 ITV comedy-drama series Auf Wiedersehen, Pet. Spall received critical acclaim for his performance in Secrets & Lies (1996), for which he was nominated for the BAFTA Award for Best Actor in a Leading Role. He gained international acclaim for his role as Peter Pettigrew in the Harry Potter films. Subsequently, he starred in many films, including Hamlet (1996), Nicholas Nickleby (2002), Enchanted (2007), The Damned United (2009), The King’s Speech (2010), Ginger and Rosa (2012), Denial (2016), and The Party (2017). He has famously collaborated with director Mike Leigh, making six films together, including Home Sweet Home (1982), Life is Sweet (1990), Secrets & Lies (1996), Topsy-Turvy (1999), All or Nothing (2002), and Mr. Turner (2014). He starred in the television documentary Timothy Spall: ...at Sea (2010–2012) and in 2014 won the Best Actor award at the 2014 Cannes Film Festival for portraying J. M. W. Turner in Mike Leigh's biographical film Mr. Turner. Spall, the third of four sons, was born in Battersea, London. His mother, Sylvia R. (née Leonard), was a hairdresser, and his father, Joseph L. Spall, was a postal worker. He trained at the National Youth Theatre and RADA, where he was awarded the Bancroft Gold Medal as the most promising actor in his year. Spall initially made his mark in theatre performing in productions for Birmingham Rep and, later, the Royal Shakespeare Company, including The Merry Wives of Windsor, Three Sisters, Nicholas Nickleby and The Knight of the Burning Pestle. Following a film debut in Quadrophenia and wider TV exposure playing the awkward Barry Taylor in all four series of Auf Wiedersehen, Pet, Kevin in Outside Edge and as Aubrey the appalling chef in Mike Leigh's Life is Sweet, Spall has since appeared in the films Crusoe, Secrets & Lies, Shooting the Past, Topsy-Turvy, Vanilla Sky, Rock Star, All or Nothing, The Last Samurai, Lemony Snicket's A Series of Unfortunate Events and The King's Speech. He gained international recognition as Peter Pettigrew ("Wormtail") in the Harry Potter film series. In 1991 he guest starred in the series 5 Red Dwarf episode "Back to Reality". In 1993, Spall was a guest in the Scottish comedy series Rab C. Nesbitt. He was appointed Officer of the Order of the British Empire (OBE) in the 2000 New Year Honours. Spall performed lead vocals on the song "The Devil is an Englishman" from the Ken Russell film Gothic (1986), in which Spall portrayed John William Polidori. Spall played the starring role of Albert Pierrepoint in the 2005 film Pierrepoint, which was released as The Last Hangman in the United States. In the 2006 video game Grand Theft Auto: Vice City Stories, Spall voiced Phil Collins' manager, Barry Mickelthwaite. In 2007, he starred as Nathaniel in Disney's Enchanted and Beadle Bamford in Tim Burton's production of Sweeney Todd: The Demon Barber of Fleet Street. He also starred as Georgie Godwin in a one-off television drama The Fattest Man in Britain on ITV 1 which aired on 20 December 2009. The drama also featured Bobby Ball, Frances Barber, Aisling Loftus and Jeremy Kyle. In 2010, he portrayed Winston Churchill in critically acclaimed film The King's Speech for which as a member of the ensemble he was jointly awarded the Screen Actors Guild Award for Outstanding Performance by a Cast in a Motion Picture. 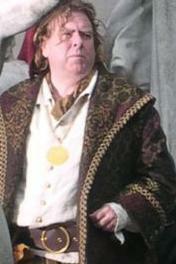 Spall reprised the role at the 2012 Summer Olympics closing ceremony. In 2012, Spall filmed Wasteland (known as The Rise in Britain), with actors Matthew Lewis and Vanessa Kirby. The Newport Beach Film Festival in Newport Beach, California, screened Wasteland in April 2013. Also in 2012 Spall played Charlie Morgan in the edgy film Comes a Bright Day. In 2014, he won the Best Actor Award at the 2014 Cannes Film Festival for Mr. Turner, a biographical film on J. M. W. Turner directed by Mike Leigh. From 29 March to 14 May 2016, Spall played the title role of Davies in Harold Pinter's play The Caretaker, directed by Matthew Warchus at the Old Vic theatre in London opposite George MacKay and Daniel Mays. Spall and his wife Shane have three children: Pascale (born 1976), Rafe (born 1983), who is also an actor and Mercedes (born 1985). He lives in Forest Hill, south east London. I didn't know what made me ill but stress had something to do with it and the point is now to head off stress at the pass. It made me aware of things and become more selective. I am less worried about employment. I really do my homework so I am not getting stressed on the set because I don't know what I'm doing. He is the owner of a Dutch barge that he and his wife have been sailing around the British Isles as part of a BBC Four TV series Timothy Spall: Back at Sea. ^ Smith, Julian Llewellyn (20 August 2001). "Timothy Spall: A bloke for all seasons". The Independent. ^ Deborah Ross (12 January 2008). "Timothy Spall: Lucky Tim – Features – Films". London: The Independent. Retrieved 30 January 2012. ^ "Timothy Spall: Victim of his own success – Profiles – People". The Independent. London: News.independent.co.uk. 30 March 2006. Archived from the original on 10 January 2008. Retrieved 30 January 2012. ^ "You'll know the face". www.smh.com.au. 17 January 2004. Retrieved 30 January 2012. ^ "timedetectives.co.uk" (PDF). Retrieved 13 February 2013. ^ "ENTERTAINMENT | Spall and Steadman collect OBEs". BBC News. 13 June 2000. Retrieved 30 January 2012. ^ liner notes from the 2009 reissue of the Thomas Dolby album The Flat Earth. Dolby composed the score for Gothic. ^ Lynn Barber (30 September 2002). "Timothy Spall: Cruise, characters and chemotherapy | Film | The Observer". London: Film.guardian.co.uk. Retrieved 30 January 2012. ^ Stuart Jeffries (5 November 2007). "Stuart Jeffries talks to Timothy Spall | Film | The Guardian". London: Film.guardian.co.uk. Retrieved 30 January 2012. ^ "Timothy Spall goes down to the sea". London: The Daily Telegraph. 24 April 2010. Retrieved 30 January 2012. ^ "/ Arts / Film & Television – Nothing to lose, everything to enjoy". Ft.com. 8 April 2006. Retrieved 13 February 2013. ^ "Timothy Spall: Our mutual friend". The Independent. 1 April 2006. Retrieved 16 February 2018. ^ "BBC News – Actor Timothy Spall rescued by Sheerness lifeboat". bbc.co.uk. 25 August 2011. Retrieved 30 January 2012. Wikimedia Commons has media related to Timothy Spall.